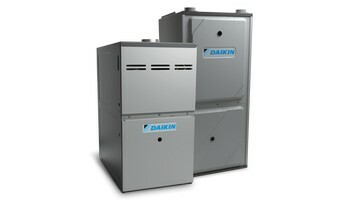 Gas furnaces from Daikin supply warm indoor comfort to your home. Our lineup of variable and multi-speed furnaces eliminate the ‘cold air blow’ of single speed furnaces for heating solutions that deliver maximum energy efficiency and savings. A Daikin brand high-efficiency gas furnace with modulating gas valve and variable-speed blower provides outstanding efficient and economical heating performance. Unlike single-stage gas furnaces that operate 'all on' or 'all off,' a Daikin modulating, variable-speed gas furnace minimizes energy use by running at the lowest possible fan speed, and producing just the right amount of heat to keep a steady, comfortable temperature in your home. Up to 98% AFUE - This gas furnace converts up to 98 cents of every energy dollar into indoor comfort in your home. Variable-speed motor provides quiet system startup and shutdown with highly efficient performance Modulating gas valve operates between 35%-100% capacity, providing the ultimate in comfort and precise efficiency.A Daikin brand high-performance gas furnace with modulating gas valve and variable-speed blower offers second-to-none efficient and cost-effective heating performance. As opposed to single-stage gas furnaces that run 'all on' or 'all off,' a Daikin modulating, multi-speed gas furnace minimizes energy use by operating at the lowest possible fan speed, and producing just the right quantity of heat to maintain an even, comfortable temperature in your home. Up to 97% AFUE - This gas furnace converts up to 97 cents of every energy dollar into indoor comfort in your home.Variable-speed motor provides quiet system startup and shutdown with highly efficient performance Modulating gas valve operates between 35%-100% capacity, providing the ultimate in comfort and precise efficiency. A Daikin brand high-efficiency gas furnace with two-stage gas valve and multi-speed blower provides substantial energy efficiency with effective heating performance. Unlike single-stage gas furnaces that operate 'all on' or 'all off,' a Daikin two-stage, multi-speed gas furnace matches air delivery with heat required to minimize energy use and produce just the right amount of heat to keep a steady, comfortable temperature in your home. A Daikin brand high-efficiency gas furnace with two-stage gas valve and variable-speed blower provides outstanding efficiency with economical heating performance. Unlike single-stage gas furnaces that operate 'all on' or 'all off,' a Daikin two-stage, variable-speed gas furnace minimizes energy use by running at the lowest possible fan speed to produce just the right amount of heat to keep a steady, comfortable temperature in your home., A Daikin brand high-efficiency gas furnace with two-stage gas valve and multi-speed blower provides substantial energy efficiency with effective heating performance. Unlike single-stage gas furnaces that operate 'all on' or 'all off,' a Daikin two-stage, multi-speed gas furnace matches air delivery with heat required to minimize energy use and produce just the right amount of heat to keep a steady, comfortable temperature in your home. A Daikin brand high-efficiency gas furnace with multi-speed blower provides efficient heating with reliable, quiet operation. Unlike single-speed gas furnaces that operate 'all on' or'all off,' the multi-speed blower will run at lower speed unless conditions demand maximum airflow, providing you with quieter indoor comfort and more energy-efficient operation. Up to 92% AFUE - This gas furnace converts up to 92 cents of every energy dollar into indoor comfort in your home.Multi-speed motor automatically adjusts airflow to match comfort needs, reduces energy consumption and system noise.